I wasn't too fond of Valentine's Day as a teenager. For one, I was always single. For two, my birthday is only a week before February 14th so several times I received presents that were decorated in hearts - which only made me more angsty. Since falling head over heels for my Ogre, I've certainly changed my tune. I now embrace romantic accessories as handmade gifts, as long as they're uniquely lovely like these heart brooches I stalked down on Etsy. I have similar feelings about Valentine's Day. It still isn't my favorite holiday, but I do enjoy all of the heart items. Lovely picks. I especially like the felt heart. Link up your Friday Features with me! Valentine's Day is a holiday I can take or leave. I do like hearts, though. 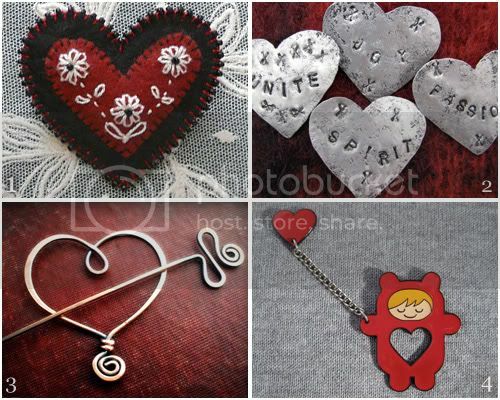 I really like that felt heart broach and the shawl pin.